Twenty years on, both the legacy of the US nuclear testing at Rongelap Atoll and the death of photographer Fernando Pereira in the Rainbow Warrior bombing evoke anger - as shown in the preliminary speeches by longtime campaigners Bunny McDiarmid and Martini Gotje, as well as by the author David Robie at the relaunch of Eyes of Fire. 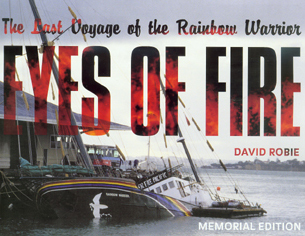 IN CHOOSING Waiheke Island for the relaunch of Eyes of Fire: The Last Voyage of the Rainbow Warrior, author and journalist David Robie was again showing the courage of his convictions. Undoubtedly a larger and more high profile event could have been organised on the mainland. But Robie wanted to acknowledge the strong association the island has with Greenpeace in general, and the sinking of its flagship 20 years ago in particular, with many of the original crew still living on the island. And of course they were at the Waiheke Community Art Gallery last Friday night as both old friends of the author as well as significant players in the book. Eyes of Fire is the most authoritative of the various works published in the aftermath of that act of state terrorism and certainly deserving of all the publicity it can get. 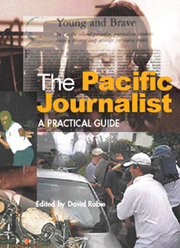 Well before he joined the vessel as a freelance journalist, robie was one of this country's foremost authorities on South Pacific affairs (he is now associate professor of journalism at Auckland University of Technology's School of Communication Studies). He was aboard to report on the vessel's mission - enroute to Auckland - of relocating more than 300 Marshall Islanders from their home on nuclear-contaminated Rongelap Atoll. That accomplishment, he pointed out, has tended to be overshadowed by the subsequent sinking of the Warrior and the death of photographer Fernando Pereira. "The book was always meant to be about Rongelap, the islanders and the crew," he said. "When the bombing happened I felt I had a responsibility to keep the story going." Writing about Pereira's death was one of the most "emotionally difficult" tasks he had even undertaken. Twenty years on, both events still evoke anger - as evidenced in the preliminary speeches by longtime campaigners Bunny McDiarmid and Martini Gotje, as well as by the author himself. Gotje reminded the audience of the utter indifference of first the United States and then France to the effect of radioactive fallout on the local communities they were contaminating with nuclear tests. Between 1946 and 1962, said Robie, US tests in the Marshall Islands were the equivalent to 8600 Hiroshima-sized bombs. "I found it quite traumatic and disturbing being involved in the relocation of people from Rongelap and the hardship that posed." And it was with an ironic eye that he mentioned the recent bombings in London and the accompanying "historical revision" occurring in the political rhetoric from the West. "Twenty years on I feel, politically, quite strongly about this, in this age of the war on terrorism, that Fernando was a victim of state terrorism." 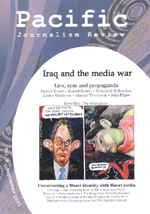 Copyright © 2005 David Robie and Asia-Pacific Network. This document is for educational and research use. Please seek permission for publication.